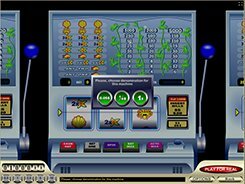 Aqua is a 3-reel 1-payline video slot that closely resembles a retro-style machine equipped with a lever, massive control buttons, and a coin box. Once the game is loaded, you are asked to choose a coin value that can then be changed at any time during your gaming session. There are also pop-up info tips that can be disabled in a single click. 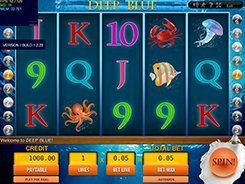 The slot has a sea theme and the symbol set includes fish, starfish, octopuses and shells. You may select one of the five coin values ($0.1, $0.5, $1, $2 and $5), and place up to three coins per line, thus the maximum stake is $15 per spin. The highest win of 5000 coins ($25,000) is awarded for hitting three shells across the payline. To grab this jackpot prize, you need to place three 5-dollar coins, otherwise your winning for that combo would be much smaller. The slot has no wilds, scatters or bonus rounds whatever; however, its simple gameplay will take the fancy of both novices and slot devotees who like traditional machines. PLAY FOR REAL MONEY!